Oscar W. Sherwin, 73, died at his home, 31 South Main Street, Thursday morning. He was a son of Jonathan and Margaret Christy Sherwin of Grafton, where he was born Nov. 10, 1825. He came to Brattleboro in 1864, and lived here the greater part of the time since then. He was among the oldest employs of the Estey Organ Company. 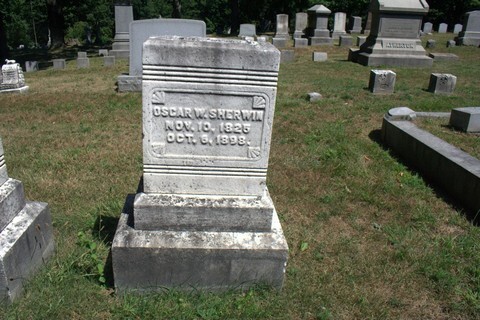 He was a member of Company D. Sixteenth Vermont regiment, and Sedgwick Post, G. A, R. of Brattleboro. He is survived by a wife and daughter, Mrs. P. E. Polland, of Waltham, Mass., a brother, Solon Sherwin, of Springfield, this state, three nephews, Christy Sherwin, of Dallas, Texas, C. H. Cambridge, principal of the Peacham Academy, ( Vt. ), and Prof. W. H. Cambridge, of St. Mark's School, Southboro, Mass. Mr. Sherwin was highly esteemed by all who had acquaintance with him. Unassuming in manner, he held his friends by force of upright character, being well informed from careful reading and possessing a retentive memory his conversation was such as would leave lasting impressions for good.